DEFENSIBLE SPACE: Not only is this all-new G&C home (above, upper right) built to California’s strict fire code, its low, green, and succulent-rich landscaping provides a buffer against wildfire. 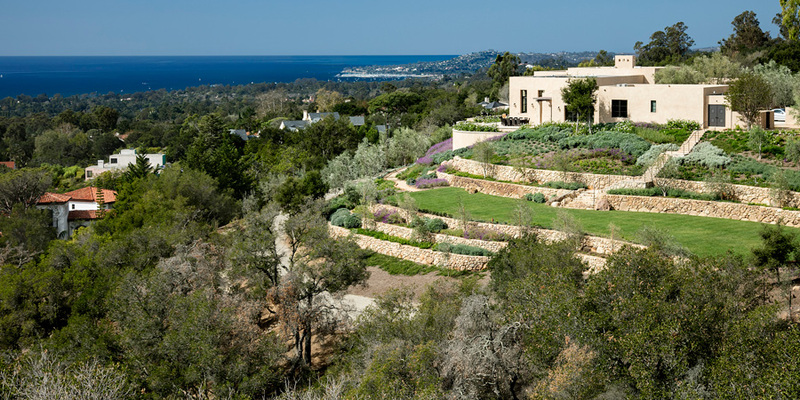 Living in the foothills along the South Coast of Santa Barbara, particularly Montecito, clearly has its upside: long views across the city and on out to sea; a steeply rugged backdrop of sandstone peaks; and all of it soaked in Mediterranean microclimates approaching perfection. Every year, however, as days get dry and winds pick up, we’re reminded that not all is perfect in paradise. That same mix of enchanting climate and landscape is also home to the region’s most common natural disaster: wildfire. Fortunately, greater Santa Barbara has some of the best multi-agency firefighting cooperation in the state, if not the country. On October 29, 2015, in the canyons above Montecito, for example, the early morning Gibraltar Fire — driven by hot winds gusting to 40 mph — lived a very short life as crews from Montecito Fire Protection District, Santa Barbara County Fire Department, the U.S. Forest Service, and other agencies contained the blaze to just 21 remote acres of chaparral before it raced down-slope, where it would have mounted a very serious threat to San Ysidro Ranch, Lotusland, and billions of dollars worth of surrounding real estate. Certainly, homes built to code — stucco and tile, tempered glass and sprinklers, and with little to no exterior wood, for starters — are made to fend off super-high temperatures and deadly embers. As Montecito is home to many of our all-new estates and extensive renovations, Giffin & Crane is keenly familiar with California’s strict building code in aptly named Very High Fire Hazard Severity Zones. Above and beyond building code, however, exists another layer of protection every homeowner is bound to follow: maintaining defensible space around their homes. For more information, check out Montecito Fire’s Community Wildfire Protection Plan.